When executing a Simulation in Enterprise Architect it is possible to set break-points, fire triggers, examine variables, record a trace of execution, set simulation speed, view the call stack and visually trace the active nodes as the simulation proceeds. When a Simulation runs, some aspects such as the output and console input are found in the Simulator window itself, while others such as the local variables and call-stack use the standard Execution Analyzer windows. The table below provides an overview of the main Windows used during Simulation. The Simulation window provides the main interface for starting, stopping and stepping your Simulation. During execution it displays output relating to the currently executing step and other important information. See the "Run Model Simulation" topic for more information on the toolbar commands. The Simulation process also makes use of the Simulation Breakpoints tab of the Breakpoints & Events window (Analyzer | Breakpoints & Events). In here you set execution breakpoints on specific elements and messages in a Simulation. See the "Simulation Breakpoints" topic for more details. The Simulation Events window (Analyzer | Simulation Events) provides tools to manage and execute triggers. Triggers are used to control the execution of State machines transitions. During the Simulation the Call Stack window (Analyzer | Call Stack) displays information about the Threads and current execution context of the Simulation. The Simulator supports multi-threaded Simulations and will include a Thread entry for every active and paused thread of execution. For each thread, the Call Stack window will show the start or entry context (eg. a State Machine element) plus the current active element within that thread. If the current active element is the entry point of a composite activity or sub-machine state, the stack will also include the current active element within that sub-context (and all further nested, active composite, sub-states as well). 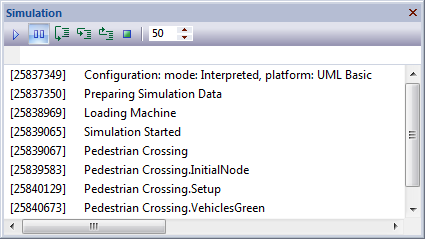 The Simulator uses the standard Locals window (Analyzer | Locals) to show all current Simulation variables when the simulation is paused at a break point or single stepping. Note that it is possible to dynamically update these variables using the Simulator Console described above. During execution of your Simulation, a recording is kept of all activity and displayed in the Record & Analyze window (Analyzer | Recorder). This is similar to how the normal call recording works in the Visual Execution analyzer - although at this time, no ability to generate sequence diagrams from recordings is possible.